Auto title loans have been around in one form or another for many years. 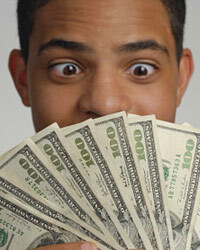 Many cash advance stores use auto title loans as a way to get customers the cash that they need quickly. In most cases, you can go into a cash advance store, give them the title to your car and have money deposited into your account within a few hours. While it sounds very tempting, there are a lot of negatives about using this type of loan. Here are a few reasons that you should avoid getting an auto title loan. Auto title loans are notorious for having very high interest rates. In fact, they will have the highest interest rates of any type of loan that you could possibly get. The rates that you get from an auto title lender are even much higher than credit card rates. Everyone knows that you should stay away from credit card interest, but car title loans put that interest rate to shame. In most cases, the effective rate that you pay for a title loan is over 300% APR. Since the loans are such short-term lending instruments, most people never stop to realize exactly how much they are paying for the loans. However, they are always going to cost you more than the money is worth. On top of the unbelievably high interest rates, you could be hit with a number of fees for these loans as well. Depending on your situation, they could charge you fees for several different things. If you are late on a payment, they will charge you a very high late fee. If you need to extend the loan, they will have loan extension fees. You may have to pay application fees, processing fees, or something else similar. They might even convince you that you need to get a roadside assistance package or something along those lines. Besides the normal short-term loans that these places typically provide, some of them also have a more long-term plan. This plan is called a balloon loan and involves paying only the interest on the loan each month. This is almost always a recipe for disaster as the amount of money that you pay in interest fees over the term will often be as much as the amount of money that you borrowed. You spend months paying the interest, and then at the end of the term, you still have to pay off the entire amount that was borrowed. The biggest reason to avoid an auto title loan is that it could potentially cost you your vehicle. You will have to make the payments on time or they could potentially repossess your vehicle. Even if the amount that you borrowed is worth less than your car, they can still take the car and sell it to get what is owed. This is a very risky proposition that could drastically affect your way of life. Abstract of Title vs Chain of TitleHow Much Do Title Search Companies Typically Cost?Avoid the Dangers of Car Title LoansWhat Are Title Insurance Endorsements?